In the twenty-first century, because of climate change and other human activities, many animal species have become extinct, and many others are at risk of extinction. Once they are gone, we cannot bring them back—or can we? With techniques such as cloning, scientists want to reverse extinction and return lost species to the wild. Some scientists want to create clones of recently extinct animals, while others want to make new hybrid animals. Many people are opposed to de-extinction. Some critics say that the work diverts attention from efforts to save species that are endangered. Others say that de-extinction amounts to scientists "playing God." Explore the pros and cons of de-extinction and the cutting-edge science that makes it possible. This well-conceived science title introduces the fascinating new field of de-extinction. Starting with the 2003 attempt to clone the recently extinct bucardo, the book explores how science and technology might be used to restore lost species, looking at current examples along with theoretical possibilities. Descriptions of scientific processes are clear and succinct and typically reinforced with useful examples. Mammoths and passenger pigeons are examined in detail, and several other animals and some plants are also discussed. Background about the species and how they became extinct smoothly leads into information on what steps have been taken so far to restore them, as well as future possibilities. Complex concepts such as cloning and genome sequencing are explained early on; readers then learn how they have been applied or considered in different ways, depending on the species, available materials, and other factors. The broader implications of de-extinction are also noted, such as the potential impact of mammoths on climate change. While the technological challenges are significant, the author also raises the influence of moral and ethical concerns and potential conflicts involving politics and funding. Visual support is generally effective; it includes photographs of species and scientists and a couple of effective cloning diagrams, though only one species map. The content is current, with status updates as recent as 2016. VERDICT An excellent overview of an intriguing new topic; highly recommended for science collections. Could woolly mammoths roam the earth again? Following an overview of the planet’s five previous mass extinctions and why scientists believe we are in the midst of a sixth extinction, Hirsch examines how science could bring back some of these extinct species. She explains the limited success of creating a bucardo, a kind of ibex that went extinct in 2000, and how the process of de-extinction—injecting extinct animals’ DNA into somatic cells—could potentially bring back the woolly mammoth, passenger pigeon, and other once abundant species. In this detailed and balanced approach, the author considers necessary factors, such as viable habitats and if related species can act as parents, as well as the numerous pros and cons of this tremendous undertaking. Color photos illustrate some of the species in question and depict scientific work already in progress. Other topics include why Jurassic Park will never be a reality, and how “frozen zoos” are collecting DNA samples from endangered species. A thought-provoking STEM title for research and debate. This book describes how researchers are trying to bring back extinct species or help threatened species. Methods of “de-extinction” addressed include cloning recovered cellsand piecing a DNA sequence back together. Particularly interesting was the discussion about ethical, ecological, and social questions, such as “Should we try to bring back an extinct species?” and “Would this technology be better used to help threatened species recover versus bring back extinct species?” Another question is whether bringing back a species such as the woolly mammoth might have unexpected consequences, such as reviving tundra grasslands, which could affect Earth’s climate. The book also points out the hard work that would be required to restore a species: the expense, necessary cooperation among researchers, reintroducing species into the wild, and the long-term commitments from governments and other organizations. Does de-extinction address core issues in conservation biology—that is, the coexistence of humans and wild species? What happens if we find out that a species we brought back is invasive or harbors a disease? This book effectively explains difficult concepts such as cloning, evolution, and population bottlenecks. It describes reasons for extinction, ways to save species and their habitats, and how even a high school student can help preserve biodiversity. This book will help any teacher put together a great lesson on extinct species and how to bring them back. 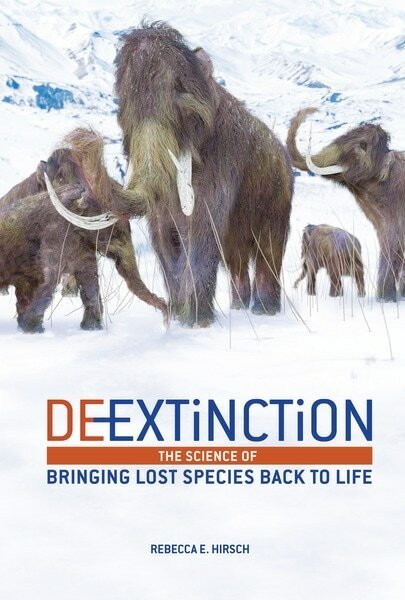 ​Written especially for young adults, yet utterly fascinating for readers of all ages to browse, De-extinction: The Science of Bringing Lost Species Back to Life is about advances in scientific technology to potentially bring back animal species that have gone extinct. A real-life "Jurassic Park" scenario doesn't exist yet, but projects to clone recently extinct animals, such as the gastric- brooding frog of Australia, are underway. Alternatively, it may be able to hybridize or genetically modify living animals to make them more like extinct animals, such as a modern Asian elephant that resembles the extinct woolly mammoth. A wealth of full-color photography, a glossary, a bibliography, and an index enrich this eye-opening introduction to a potential revolution of the natural order. Highly recommended, especially for high school and public library collections. "Extinction is essentially a one-way street. Or is it? "Though the closest scientists have come so far to bringing back an extinct species is a newborn bucardo—a kind of mountain goat—that lived for just 10 minutes, Hirsch offers strong evidence that it's only a matter of time before we could be sharing the planet with passenger pigeons, Tasmanian tigers, and even mammoths (but not, probably, dinosaurs) once again. Although she stirs in accounts of extinctions both ancient and modern, along with stories of success and of failure in saving critically endangered species, her descriptions of how genetic material is preserved, reconstructed from scattered fragments, edited, and transferred to create clones, genetically modified organisms, and new creatures comes out as a dry if relentlessly informative mix. Frequent photos and diagrams add visual enhancements to this overview; arguments from some conservationists that "de-extinction" is a waste of resources that could be more worthily spent in saving endangered species add ethical balance; and weighty quantities of source notes and leads to further information at the end add considerable research value. A staid but intellectually stimulating excursion across one of modern biology's most promising, and controversial, frontiers.